If you’re like me and cabin fever is upon you hard and fast, then perhaps it is time to start planning for spring trout fishing in Northern Michigan! 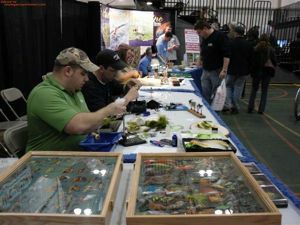 A good place to get the engine going is at the Midwest Fly Fishing Expo sponsored by the Michigan Fly Fishing Club. As in past years, the event will be held this Spring at the Macolm Community College Sports and Expo Center. The two day event will be held this year on March 13th and 14th. The Best Western Georgian Inn in Roseville has special rates for conference attendees. The group rate is $59.00+tax.The show itself has a very reasonable fee for attendance and that price includes admission to the various seminars — the potential educational value is well worth the price of the show. I’ve attended perhaps four shows in the last ten years, and it is a good time. One of the special treats for fly tiers is digging through the seemingly endless boxes of cheap, highly-discounted fly tying materials that almost everyone seems to be selling. Lots of good bargains, if you don’t mind digging around for a few minutes.